Thanks to all who participated by donating to this project! Many AHS graduates will remember the high school courtyard - a great place for senior pranks - but with very little active use. The space has turned into an Outdoor Classroom and named in honor of former biology teacher and swim coach Joe Pullen. Joe, an alum from the class of 1955, passed away unexpectedly in 2014. In 2015 he was honored posthumously with an AHS Outstanding Alumni Award. He is remembered by many for his hands-on approach to learning and as a advocate for student success. 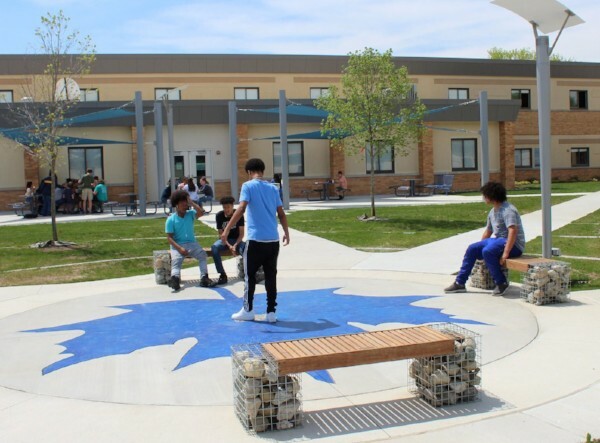 The Adrian Schools Educational Foundation sponsored a successful fundraising project which raised $235,000 to turn the 32,000 square foot space into an outdoor classroom. Joe Wilson, a landscape designer from the class of 1989, worked with students to design this space, and they are so grateful for this enhanced space! The new Outdoor Education Center features a working greenhouse, a performance stage, pads for student sculpture, a picnic area, and a classroom setting with wifi access and seating for instruction. Donations are still being accepted to put the finishing touches on the space, including funding to stock the greenhouse, install a fountain and install sail shades over the performance area. If you are interested in contributing to these endeavors, please fill out the form and submit today. By submitting the form, you will be taken to the secure Paypal site where your credit card information will be taken. You will not make a donation until you fill out the Paypal information.